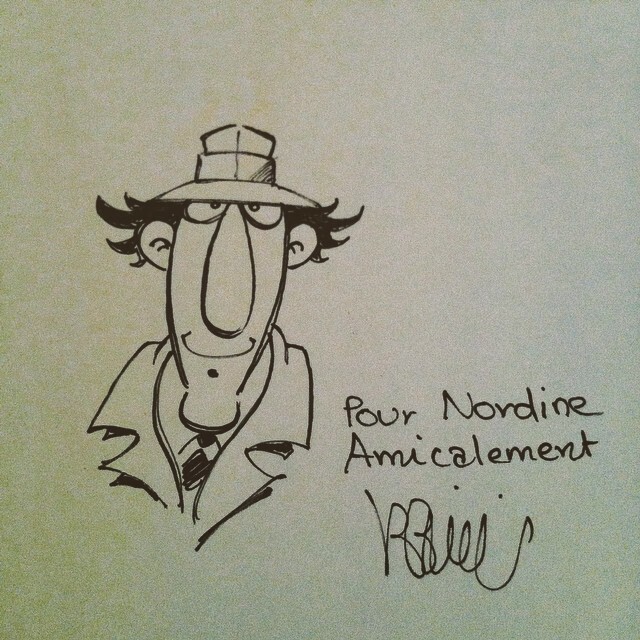 The first one - a very nice rendition of Gadget's face - was drawn for none other than Nordine Zemrak, the co-writer of the in-depth DiC history book "Les series de notre enfance". The caption reads, "For Nordine. Best wishes. B. Bianchi". I'm guessing this was done during the period when Nordine and his partner Maroin Eluasti were working on their book. Sourced from Nordine's ink361 page. The second drawing is also a bit special, primarily because it's the first time I've seen Penny pop up in one of these Bianchi pieces. This was up on Ebay a few weeks ago with the description, "Rare dédicace sur feuille de Bruno Bianchi le créateur de la série mythique inspecteur gadget. Format A4 sur papier dessin type canson. Signé" ("Rare dedication on paper by Bruno Bianchi, the creator of the legendary Inspector Gadget. A4 format, Canson drawing paper. Signed"). As we can see, it has the same year and signature type (B. BiANCHi) as drawing number one in my previous post, suggesting that they were done for the same occasion. This drawing is very loose, but I love the style on both Penny and Gadget. As with several of the previously seen drawings, Bianchi's linework here has a certain flavor of the classic French-Belgian comic book style, which is fun for me to see. Gadget's character design quite clearly came from that tradition to begin with, and Penny, while rendered simpler than her animated design, is also instantly recognizable.